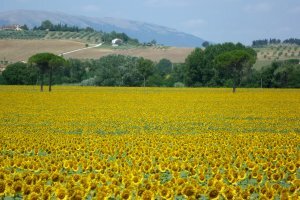 This cycle tour over the counrty roads through the sunny, colourful field and hills covered with silver-green olive groves is an great 8 days tours. You’ll visit medieval towns of the green valley ‘‘Valle Umbra’’. Towns like Assisi, Spoleto, Spello, Bevagna and Perugia. For guided options from 4 persons or more send us an email. 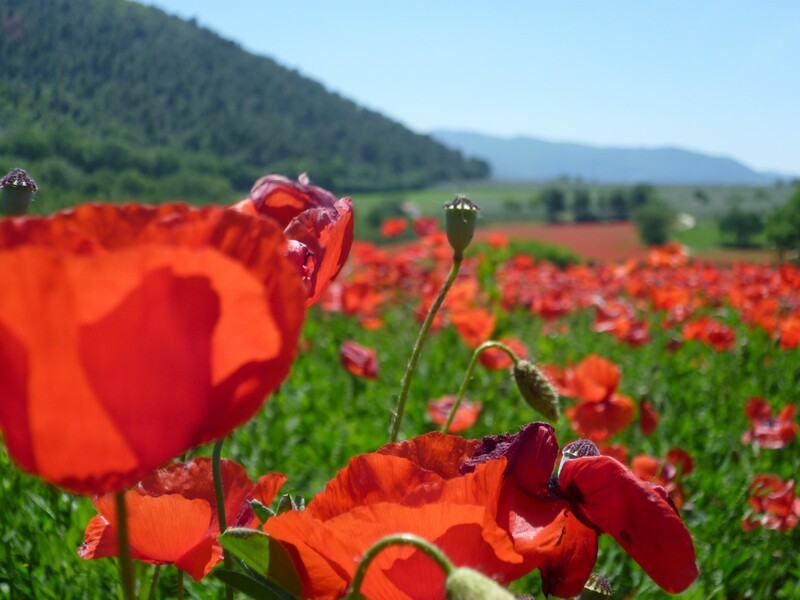 This cycle tour over the counrty roads through the sunny, colourful field and hills covered with silver-green olive groves is an great 8 days tours. You’ll visit medieval towns of the green valley ‘‘Valle Umbra’’. Towns like Assisi, Spoleto, Spello, Bevagna and Perugia. This tour is easy to ride because you cycle 30 km a day and because of the short routes you’ll have enough time to visit all the towns. Your bike tour starts at Assisi. From here you go to Foligno. Only on your first bike day you get dinner in the evening. Visit Spoleto especially relevant because of the famous frescoes by the Florentine Filippo Lippi, the Roman house and the Roman Theatre. 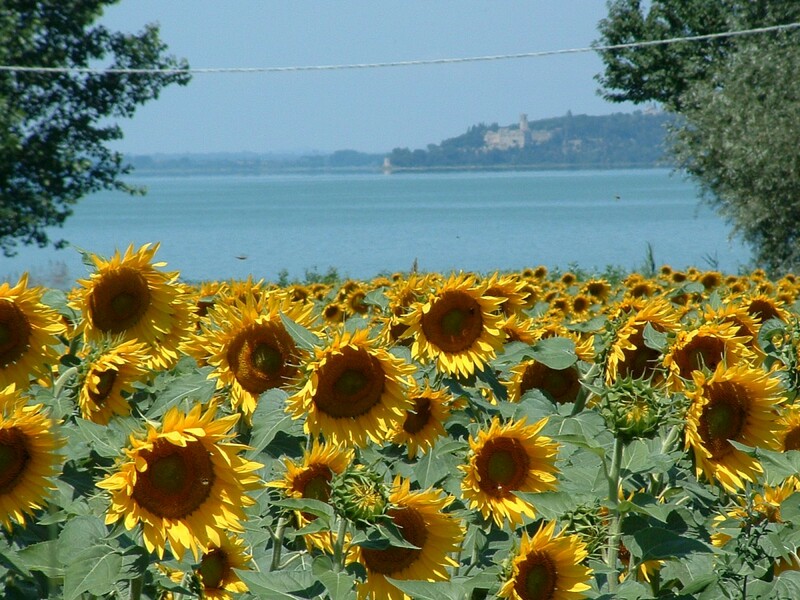 On day 4 you cycle to Bevagna. 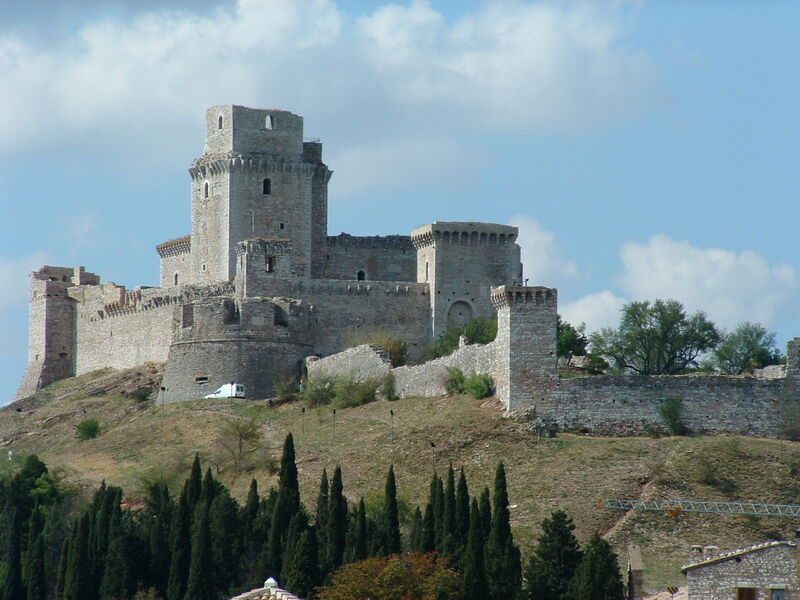 Here you’ll first visit Montefalco also know as the ”Balcony of Umbria” and visit the Franciscan church. 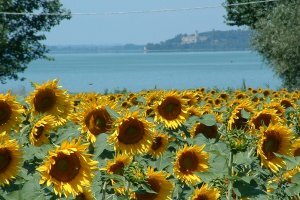 From Bevagna you cycle to Torgiano through the the valley. on day 6 you can choose to cycle the shorter route or an longer route. On the shorter route you visit Perugia with its aristocratic Renaissance palaces and medieval churches. The longer route will take you to Torgiano. 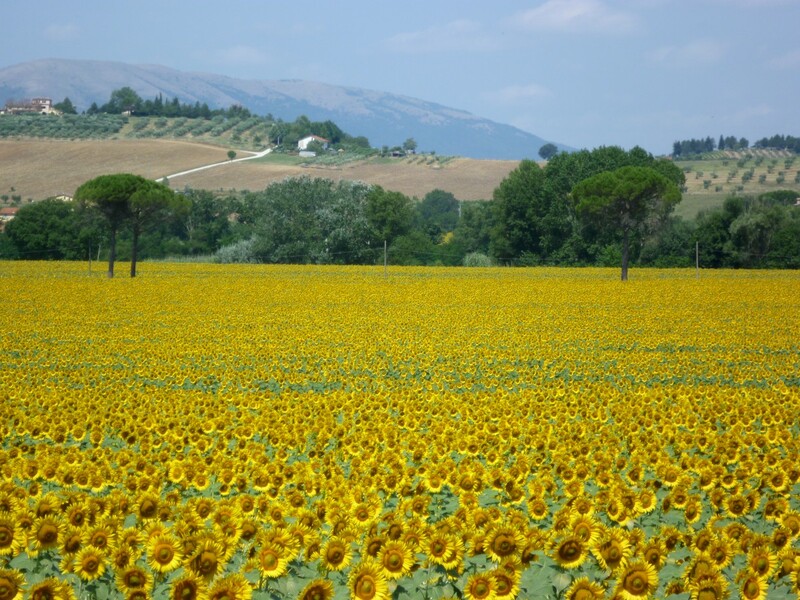 On the last day of this tour you’ll cycle back to Assisi. When you arrive You’ll have enough time to visit the main monuments. Famous frescoes by the Florentine Filippo Lippi, the Roman house and the Roman Theatre with an annexed archaeological museum. The Franciscan church, now a museum, is decorated with magnificent 15th and 16th century frescoes by artists such as Benozzo Gozzoli and Perugino. The historical centre of Perugia, which is situated on higher ground. The centre, with its little alleys and characteristic town squares. 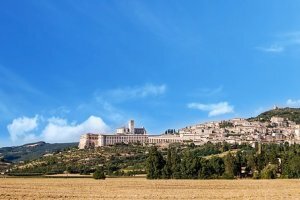 Visit Assisi with the Franciscan basilica in S.Maria degli Angeli. And the main monuments of the town, like the basilica of St.Francis with its beautiful frescoes by the painters Giotto, Simone Martini, Cimabue and Pietro Lorenzetti. Check in around 14.00 at your charming hotel in Assisi. There will be a briefing, bike fitting and the tour organizer explains the coming itinerary of this tour. 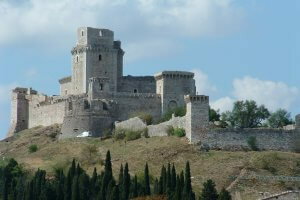 You leave your hotel and cycling along the slopes of Mount Subasio you reach Spello. There's enough time to wander about this charming old town. Spello is an extremely interesting place, containing many features dating back to Roman and medieval times. After your visit you descend to Foligno, situated in the valley. You pass along the main square with it's beautiful 'Duomo', which still has a Romanesque facade. Passing along the lively shopping street you will leave the town to cycle the last kms to reach your Country House along the Clitunno river. This morning a short tour brings you to Spoleto. 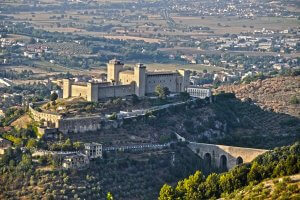 From afar you can already see its castle dominating the hilltop on which the medieval part of the town is built. The center is still largely inside the medieval town walls. 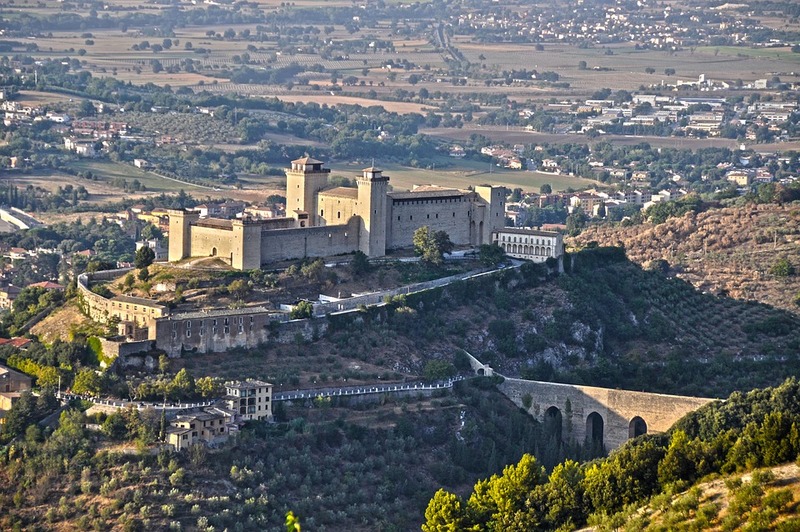 Spoleto offers a lot to see, like the 'Duomo' with its famous frescoes by the Florentine Filippo Lippi, the Roman house and the Roman Theatre with an annexed archaeological museum. Your overnight stay will be again in Bovara or San Lorenzo. In the morning you have still time to visit Bevagna. Leaving it you continue cycling mostly through the valley to Torgiano, a small ‘borgo’ at the confluence of the rivers Chiascio and Tiber (Tevere), famous for its excellent wines. Your hotel is in the quiet town center. 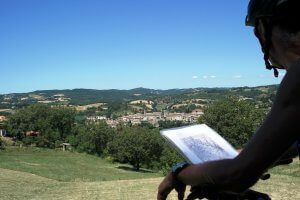 A short cycle tour will bring you to the station of Ponte S.Giovanni situated at the foot of Perugia. From here a local train will take you into the historical centre of Perugia, which is situated on higher ground. The centre, with its little alleys and characteristic town squares, is bubbling over with life. The aristocratic Renaissance palaces, medieval churches, museums and many galleries will make a lasting impression. 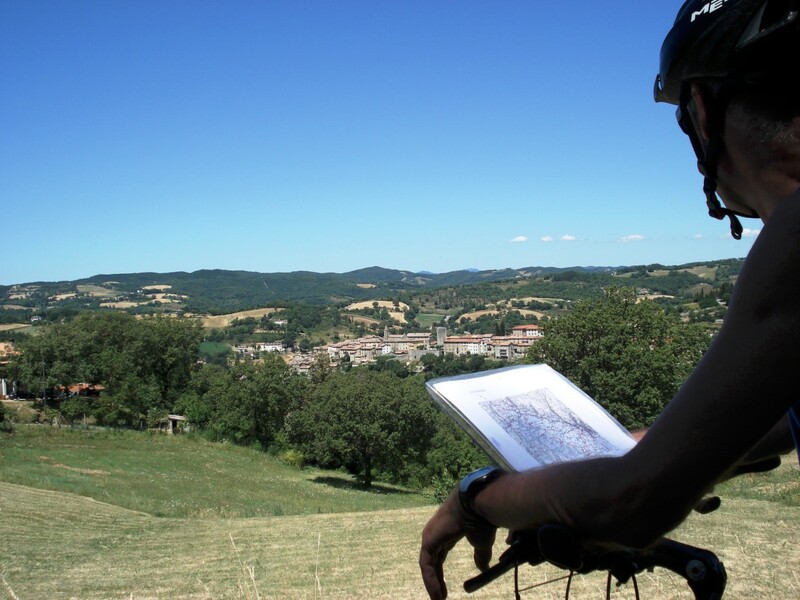 After your visit you return by train and bike back to your hotel in Torgiano. Youi can also choose to cycle all the way up to Perugia. Close to Torgiano is the village Deruta, which has, in part, managed to retain the highly distinctive features of its medieval buildings. Deruta is universally famous for its ceramics. The origins of this ancient art go back as far as the Etruscan times and nowadays the many local workshops still make excellent quality ceramics. The next stop is the sanctuary of Madonna dei Bagni, which has built after a miracle taking place in the year 1657. Inside the church there are more then 600 votive tiles, all testimony to the tradition of the ceramics of Deruta. You cycle back to Torgiano through the Tiber valley. Torgiano is famous for its gorgeous red and white wines and when you have a moment of time you could visit the interesting wine museum and go to the Lungarotti family's 'osteria' next door, where you can taste their wines. Today you will cross the valley cycling over quiet country roads. You will already see Assisi from afar as, like many other Umbrian towns, it is built on a hilltop. Before reaching Assisi, however, you can stop for a moment to visit the Franciscan basilica in S.Maria degli Angeli. Under its impressive dome still lies the humble little chapel 'Porziuncola' where Saint Francis once came to pray. 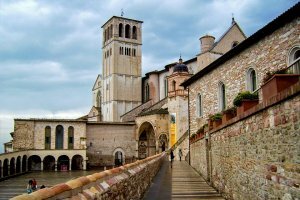 To arrive in the beautiful historical center of Assisi you have to make a short but steep climb, but wandering through the town you will agree that it was worth effort. 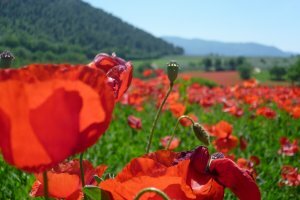 (An option could be to take the city bus from the train station in the valley and return here after your visit of Assisi to pick up the bikes again). You will have enough time to visit the main monuments of the town, like the basilica of St. Francis with its beautiful frescoes by the painters Giotto, Simone Martini, Cimabue and Pietro Lorenzetti. Your overnight stay will be in the hotel, where you started. Departure day…..Time to say goodbye, a good flight back home or a pleasant stay in Italy. Transfers upon request. Roma Fiumicino airport is the most important hub to all kind of destinations. There are many connections to almost every domestic airport in Italy and all important cities in Europe. The airport has 4 terminals. Perugia airport. The small airport at Sant'Egidio, 12km from Perugia, is reachable by bus from the city from the bus stop in Piazza Italia and from the main railway station. There are shuttle buses to Perugia Railway station. Tickets are €8.00 per person. Florence international Airport is named after one of the most famous Italians - Amerigo Vespucci. There is no train connection with the airport. From Florence railway station there are good connections to all kinds of cities in Italy. The airport is lies only four kilometers away from Florence. Shuttle buses leaving every 30 minutes. Florence airport is only 80 kilometers away from the airport of Pisa, Galileo Galilei. Pisa Airport is two kilometers from Pisa, 20 kilometers from Lucca and 80 kilometers from Florence. You can find the train station just outside the terminal. Pisa Airport lies directly on the highway Florence-Pisa-Livorno. Because the airport is so close to the city a ride (to the center of Pisa) does not take more than ten minutes. Roma’s main train station is, Roma Termini Station downtown. There is a direct train from Fiumicino Airport with the Leonardo Da Vince express. From Roma’s main Railway station Termini you can take the train to Assisi or Perugia. The Assisi Central Train Station is located in the valley below the historical town of Assisi. Frequent train service is available from the station to Rome, Florence and many other Italian cities. Once we receive your request we contact the local tour operator if the tour is available. When the tour operator confirms to us. We confirm to you and charge you’re a deposit fee of € 250 per person plus a € 15 booking fee. The balance payment is due 60 days before the start of the tour.